Luke McCullough (left) up against Harry Kane during Tranmere Rovers' FA Cup clash with Tottenham Hotspur in January. Pic by Getty Images. The 25-year-old’s season is over following the blow sustained on Saturday for Tranmere Rovers against Carlisle United and McCullough is now facing up to another long programme of rehabilitation. It marks a second cruciate problem for McCullough’s left knee following an initial injury in August 2016 which led to around nine months of hard work before lining out with Doncaster Rovers towards the end of that season. McCullough must now visit a specialist this weekend to review the situation but the Portadown-born midfielder remains determined to, once again, repair, rebuild and return. “Plenty of players have successfully come back from multiple cruciate injuries and, thankfully, modern medicine means it is no longer the career-threatening blow of the past,” said McCullough. “As disappointed as I am, I think back to my previous recovery and take comfort from how I managed to return slightly earlier than expected and have that knowledge of exactly what is required. “When I returned before everything felt brilliant to be honest and I’ve played practically every minute this season with Tranmere, so there is no reason to think there was any underlying problem. “I was running alongside someone in the first five minutes against Carlisle and just felt it when I planted my leg. McCullough, who is out of contract in the summer, has become established as a key part of Tranmere’s promotion push out of League Two this season following a loan move from Doncaster. “I’ve loved it at Tranmere and initially came in on a short-term loan deal but that was quickly extended to the full season,” he said. “The fans have been great and we are right in the play-off positions but even looking towards automatic promotion, which would be brilliant. “I’ve been used in a midfield position, either sitting in front of the back four on my own or as part of a two, so it’s a role I’ve been getting more experienced in over time at both Doncaster and Tranmere after starting out as a centre-back. 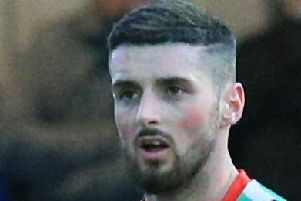 McCullough, a former Manchester United Academy captain, spent time in Northern Ireland on the books of Loughgall Youth and Dungannon Swifts before moving into professional football. He was part of the EURO 2016 international squad and won the most recent of his senior caps against Costa Rica in June 2018. 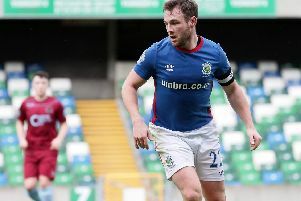 “I was thinking a return to the Northern Ireland squad would be something for the future but with my immediate focus on performing as well as possible for Tranmere then take it from there,” said McCullough. “But now everything is up in the air until I find out what the full situation is with the injury. “It can be tough dealing with a long-term injury but it’s about staying positive and setting mini-targets to meet along the way.